Nap Sleep Training: When to Start and Why? Note that this question has to do with nap and not night training. Nighttime sleep can start developing into longer stretches as early as 6 weeks of age if certain things are done to encourage those longer stretches (Wanna learn how? Check out The Newborn Sleep Program for babies under 16 weeks old). Naps, however, are a totally different story. The brain doesn’t start to organize daytime sleep until much later, at the earliest of about 14–16 weeks. When should you start nap training your baby? I strongly recommend waiting to try to elicit longer stretches of daytime sleep (assuming your baby is not having long naps already) until she is at least 14 to 16 weeks old. In some circumstances, where Mom is completely exhausted or is returning to work and would like to have baby know how to put herself to sleep before leaving her with the nanny, earlier nap training can take place at about 11 weeks. Even when a client wants to move forward at that early age, I evaluate each baby individually; the stronger willed the baby is, the more likely I am to take them on as a client at an earlier age. More laid back babies are often not as difficult to handle, so I encourage Mom to wait it out just a few more weeks. Why wait to nap train your 3-month-old? There are a few reasons I don’t like to nap train until at least 14–16 weeks of age, apart from the brain not having reached the milestone of consolidating day time sleep yet. First, it seems to take longer. When I work with little guys younger than the age range above, it seems to take them a little more time to catch on to falling asleep unassisted. Even when they do master that skill, their brain may be keeping them from having nice, long naps anyway, so we do a lot of work and still can end up with short naps. Secondly, it’s really unpalatable to Mom. Any type of sleep training that yields lasting results involves some sort of protest crying (read: we sleep peeps use the euphemism “protest,” when what we’re really referring to is the regular crying babies do when they’re pissed off, tired, frustrated, or upset). Crying, of the protest or any other kind of variety, is reallllly tough on Moms, especially for Moms of newborns. And rightly so! Because crying is so difficult on Mom (and Dad), I try to avoid starting any type of nap training in the newborn stage. For my tips and tricks on helping your newborn (and you!) get the best sleep possible, purchase The Newborn Sleep Program, created especially for babies under 16 weeks old. What is Baby Nap Training? 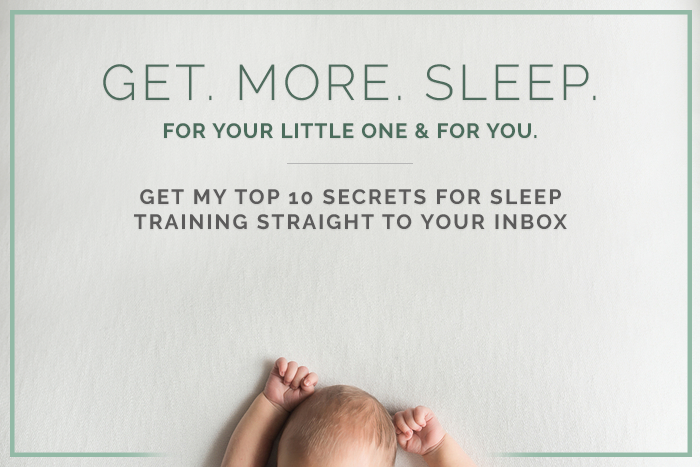 I’ve said before on this blog and I’ll say it again right now – when I say sleep training, I’m almost always referring to teaching your baby to fall asleep without your help. My experience, both professional and personal, has shown me that (most) babies as young as 4–6 weeks are capable of falling asleep on their own. To get there, though, requires an EXTREMELY experienced parent or caretaker. You couldn’t write a book that would explain every nuanced way to sleep train that early since there are many elements that vary so much from baby to baby. SO, besides the brain’s capability of consolidating daytime sleep into longer stretches, why else wait until 14 weeks to nap train? Because the brain is also starting to excrete melatonin at more regular (not random, like in newborns) intervals during the day at that age. The sun is doing its thing in regulating melatonin and it’s cousin, the circadian rhythm. In addition to the biological reasons to start at this age, I’m also a proponent of dealing with sleep issues as early as possible. It may be impossible to internalize or accept this as a first time parent, but generally speaking the older your baby gets, the more resistant they are to change. A 4-month-old baby needs more sleep, and needs sleep more, than he will at 6 months of age. A 6-month-old needs more sleep than an 8-month-old, and on and on. The longer you wait, the more upset your little one will be about the change in their sleep habits. I like to tell my clients that it’s easiest to sleep train a baby between the ages of 14 weeks to 6 months, then slightly less easy from 6 months to 8 months, than tougher from 8 months to 10 months. I’m ready to sleep train! Whatever you do, blog readers, please consider nap sleep training (and night sleep training!) your babies before the age of 10 months. Once baby hits that stage it’s more like dealing with a toddler rather than a baby. A 10-month-old can often stand, yell, and just generally flip out way more than a younger infant. Also, a 10-month-old can go way longer without sleep than a 4-month-old, which means more energy and stamina to protest. Doing it earlier is easier on Mom, and more importantly, on baby. One thing to keep in mind is you want to count age from your child’s estimated due date. So, if your kiddo was born 2 weeks early, you’ll want to wait until they are 16 weeks to nap train, since that’s 14 weeks from when they were the full 40 weeks. When we talk about brain development in the first 6 months, every week counts. If you want to learn more about an age-appropriate nap schedule for your little one, and how to set them up for optimal sleeping success – sign up for my newsletter! Thanks for the post. I will keep all these in mind when my second baby is born. What would you recommend for a 16 month old who cannot put themselves to sleep for naps? I know I missed the mark, and like you said, he’s very strong willed and won’t lay down. I know he can self soothe because at night we lay him down awake and he puts himself to sleep, but nap times are a different story. 16 month olds are tricky, mostly because they can (often) climb out of the crib. If your little guy can’t crawl out, then I would suggest searching for a method that you might use on an infant and do that. If he can get out of his crib, then you’re better of searching for a toddler-oriented method. I will tell you, though, if he is strong willed, you need to be make sure you’re ready to outlast him. Whatever type of method you choose, you need to STICK WITH IT! The more involved in the process you are, the longer it’ll take for it to work, but as long as you’re consistent, you should see progress. my is LO is 13m – about 3 weeks ago, her 4th molar came in + 2 incisors on bottom. (her sleep at night is great and falls asleep on her own. naps use to be ok (nurse to sleep) and sleeps when put on crib to sleep.) then 3 wk ago she would turn and scream as soon as I put her down in crib for nap. I let her cry for 1 hr once and she flipped out. (not knowing she was teething) I was so heartbroken seeing her like that I never let her cry again for nap until today (20min going strong and wide awake). So one thing that often comes up is babies who fall asleep on their own at bedtime and sleep well at night but need help to fall asleep for naps. The reason I encourage parents to nap train is because sooner or later (but almost always before the baby is ready to stop napping) whatever has been helping the baby to fall asleep stops working as well. I don’t think she’s ready for one nap as much as she’s ready to fall asleep to fall asleep on her own, preferably in her crib. You’ll want to pick a method, stick to it, and get her napping on her own in her crib. My little guy is 15 weeks and after rolling swaddled last night, he’s moved up our sleep training a couple weeks! I have a question that is easier to explain as an example. This afternoon I put him down and he intermittently cried for 25 minutes and then slept for 30 minutes. What happens next? I don’t want to sleep train these early wake ups because I’ve read it takes more brain maturity for that. Do I help him go back to sleep if it takes less than 5 minutes? Get him up and put him down when he has tired signs? Keep him up for his typical 75 minutes of wake time? Also, we usually have a cat nap at the end of the day, but if he takes 30 minutes to fall asleep, even a short nap will push his bedtime back considerably past 7. I’m not sure what to do in that situation. We’re going off of the Healthy Sleep Habits Happy Child book for our method. Thanks so much! This is a great question. The thing is, it’s tough to answer because there isn’t a set answer to what to do unless you already have a whole set pattern or method you’re adhering to. Does that make sense? In order to know what to do next, you want to have a plan in place so that you can know what to do for each nap and at bedtime. Thanks! We’ll make up a plan of attack and stick to it; most likely going with sleepy cues until he has some progress and then stretching him some to get to the three naps a day you posted about earlier. Hi Natalie! My LO is almost 7 months and sleeps through the night pretty consistently (yay), and falls asleep on his own. But he has a hard time falling asleep on his own for naps. I am told nap training is much harder and takes longer. Any tips? Thanks! a littlе comment to support you. very compelled me to take a look at and do so! Your writing style has been amazed me. online for flight simulator and virtual airline enthusiasts. You can interact with your pets, feed them, and care for them. don’t have enough time to go hunting. That’s where this quiz comes in. It promotes the efficiency of blood circulation to help expel toxinsfrom the body. one consumess is ery important to one’s health. of its precursors, the Jupoiter Masterpiece and Jupiter Mavello. USA or othr countries because it is a little bit more costly thawn local one orr another brand. conductor, power generation, lubricant, coolant and heat reservoir. Hi Natalie, I’m a first time mom and recently purchased your book! My son is 7 and a half months old and we are on night 7 of sleep training. Night time sleeps have come a LONG way. I experienced the 4mth sleep regression, had to nurse him, wrap him and then nap him in order for him to sleep during the day and at night, put him in the bed beside me. Now at night he’s sleeping an average of 10 hours. I’m happy but I don’t want to get too excited yet… because during the day he WON’T nap. We started Nap training the next day. I’ve followed the instructions to a T in your book and we’re not having any success. Yesterday, he went from 6am to 1pm with no sleep and clearly tired and needed it but screamed the entire time in the crib. I finally got him to sleep by holding him after I nursed him. Right now we are expecting his 5th tooth and I see he looks like he’s ready to crawl, but we are at our wits end… we don’t want night time to come undone but we’re really struggling with naps so far. Any suggestions? Hi Aneesa! Thank you for purchasing my book! Please come join one of my Facebook Live Q&A’s too which happen every first and third Tuesday night of the month at 7:00pm Pacific Time (www.facebook.com/babysleeptrainer) – and ask any questions you may have there as well! Also remember, it can take up to 2 weeks for naps to regulate and become more consistent. The most important thing is that you commit to not helping him fall asleep. Eventually he really will fall asleep on his own (as long as you’re confident he’s 100% fully healthy). If I hold him he will nap for hours but alone it’s a 30 minute nap at the most. How do I get him to sleep longer than this cat nap? Hi Cynthia! Cat naps are absolutely normal up until 6/7 months old! If you hold out just one more week (once baby is 16 weeks from their estimated due date), you can begin my sleep training program! Check out my online training series if you’d like to learn more https://www.babysleeptrainer.com/purchase/. My little one is 8 weeks old, and although I know I have quite some time until she is ready to be sleep trained, (nighttime sleep is rough, but I’ll have to wait on that). In the meantime, I was hoping for some advice regarding naps. Basically, she won’t nap unless she is being held. The moment she is put down, she wakes up. Sometimes upset, but most of the time, eyes open and will sit there for a while. Do you have any advice for fixing this? I’ve put her down and let her cry before, but the crying can go on for quite some time, and seems to only wake her more. Hi Sara! I think you would like my Newborn Sleep Program: https://www.babysleeptrainer.com/purchase-newborn-program/ – in this program I give ALL of my best tips for helping baby to get their best sleep at nighttime and for naps. It’s for ages 0-16 weeks! Hello! My daughter is 5 months old and I’ve been on the baby sleep trainer method for two weeks now. She is doing great at night, and falls asleep for her naps (3 per day) fairly easily. However, she wakes up after 35 min every time. I leave her alone without checking on her and she will fall asleep a second time, generally after about 15 min of wakefulness. She will sleep again for 15 to 45 min, I get her up after she wakes for the second time. I expected that her naps would get longer, and would eventually be 1 to 2 hours at a time, but that doesn’t seam to be happening. Is she too young, does she just need more time?